NB We feel that BPC mis-represented this request in their posted agenda. We have included the associated 40+ NDP Questions with Related Notes below. Please keep in mind that all UK Local Planning Authorities (like NSC) appear to have been tasked by central government with promoting NDPs so that communities agree to some level of development in their area and to help NSC fulfill their housing development quotas. Also, NDPs have been created to speed up the planning process and make cost savings e.g. with fewer public appeals needing to be passed to the Planning Inspector by residents trying to stop developers; as communities will have 'pre-agreed' the development! At the same time financial incentives may be 'earned' by NSC and BPC through the 'New Homes Bonus' and increased CIL (Community Infrastructure Levy). (See Government Incentives). So, how many houses do NSC need to build? What is Bleadon's 'share' of houses to be built and by when? E.g. Claverham statement and Q42 below. A Neighbourhood (Development) Plan may, or may not, be a good thing for Bleadon but let's at least have an informed debate that 'all' residents can access and engage with, before wasting precious public expenditure and disenfranchising residents like BPC has done with their approach to our 'current' Parish Plan. Below is an email to BPC on 02 Apr 18 prior to the BPC AGM on 09 Apr 18 in repsonse to their call for agenda items/resolutions and questions for the meeting. We/BOB/Residents welcome the opportunity to finally discuss the Neighbourhood (Development) Plan (NDP) with BPC in an open forum on 9 April 2018. This will hopefully give residents the opportunity to ask councillors about their decision to have a NDP and to ask questions about the project to date, BPC’s approach, timescales and costs in potentially implementing one. Although we understand that Cllr Dobson and Cllr Chinn have just resigned we feel it would be helpful if all councillors that have been involved in the project decision making to date could attend the Q&A, especially Cllr Dobson as BPC’s website states that BPC “are grateful for his offer to continue to be involved with the work of the parish in a resident capacity. We look forward to working closely with him.” If this is not possible we appreciate that as the NDP project was a full council decision the remaining councillors will already be fully informed and able to answer the questions posed. We know that BPC is currently refusing to answer resident questions raised via us/BOB for two years, i.e. until Feb 2019 under it’s dubious ‘vexatious’ policy, but given the cost and subsequent lack of credence BPC gave our Parish Plan when every resident was involved in the process, we feel a poll of 'all' Bleadon electorate should be made before BPC incurs any expense on a Neighbourhood Plan from public/BPC precept budget or reserves. To our knowledge (we asked but no reply) BPC owns no significant land for development so will presumably need to agree with selected landowners and developers for any development identified in a NDP to be implemented. So, considering the large scale developments being proposed in our community and those previously, like the school with 250 houses and the 79 houses on Bleadon Hill, why haven`t BPC directly consulted all residents on a NDP so far? Do you (residents present at the meeting) feel fully informed by BPC about Neighbourhood (Development) Plans and fully understand the process, its financial, environmental and community implications and are happy for BPC to continue to spend an undeclared amount of public/resident money in developing a NDP (i.e. potentially tens of thousands of pounds); or do you think that, as this project is already 9 months old, BPC should fully inform and ask ‘all’ residents before they continue with the NDP project? Perhaps an appropriately worded poll should be considered at the Annual Parish Meeting E.g. like Yatton http://nomoordevelopment.info/action/parish-poll/. In response to BPC’s public notice/leaflet, “If you have request for what should be presented and discussed at the meeting”, please can you also raise and answer the following existing resident questions at the April meeting on behalf of interested residents. As the NDP project started last June/July 2017 many of these questions will have already been answered internally but not necessarily published to ‘all’ residents. It would help if BPC would publish the answers to the following questions on the BPC website as previously requested before residents attend the meeting on 9 April 18, in order to assist public discussion and help residents make any decision on whether to continue with a NDP. If BPC will not publish the answers beforehand, and as only approximately 150 of the 1000+ Bleadon residents can fit in the village hall, please can you also post the resulting answers to our and all other questions asked at the meeting ASAP after the meeting on the BPC website, publish them in the next BPC newsletter, and send us a copy/link to the response, so that ‘all’ residents can be informed of the ongoing NDP project situation? Please could BPC put the Neighbourhood (Development) Plan (NDP) and the existing adopted Bleadon Parish Plan (2009-2029) (PP) into context? 1. Does the Bleadon NDP have to comply with the NSC local plan, that has to comply with Regional (e.g. JSP) and National Planning Policy (NPPF)? 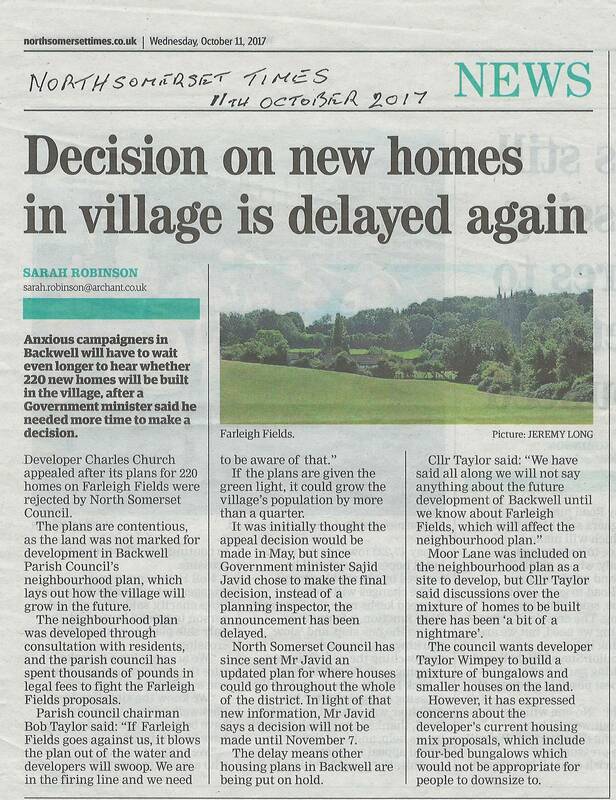 If so, why can’t residents just continue to rely on the NSC planning policies that currently protect Bleadon; like the majority of the 10,000 town and parish councils and communities who currently rely on their district planning policies? 2. What is a Neighbourhood (Development) Plan? 3. What is a Parish Plan and what happened to Bleadon’s? 4. What is the relationship between the PP and the NDP? 5. Is it still true that "... figures indicate that plans for housebuilding are more than 10% higher in areas that have a neighbourhood plan than in the council’s local plan."? i.e. NSC’s local plan. 6. What are other local NSC parish councils doing regards NDPs and PPs e.g. those in our NSC electoral ward of Hutton and Locking? Please can BPC indicate how a NDP can be used to ‘protect’ our community and environment? 7. What are the pros and cons, merits and disadvantages, of a NDP as discussed by BPC in Dec 17? 8. In Dec 17 BPC also stated “The view of the Council was that an approved Plan would assist the planning authority to defend against undesirable planning applications.”, how would this work? 9. In Feb 18 BPC stated “the opportunity to limit current over-development has been lost”, how can a NDP limit development? How was the opportunity lost? Please can BPC outline the NDP project and associated timescales? 10. How long will a NDP take to create? 11. What is BPC’s plan for the project and when will the project plan be publicly accessible? 12. How frequently will the NDP need to be maintained and updated, and how will it be kept in-line with changing national and local planning policies? Please can BPC outline the NDP project and its associated costs? 13. How much does BPC estimate its NDP will cost? 14. How will the NDP be paid for? 15. Will residents have access to the costs incurred as the project progresses? 16. How much will each updated NDP cost? Whose views will be used to create a NDP before it is put to a Referendum, ‘all’ residents and/or some ‘stakeholders’? 17. Who has BPC been consulting with since the project began in Jun/July 2017? 18. Who creates the draft NDP? 19. How is BPC deciding what residents want to be built and where? 20. What land is BPC proposing to offer to develop in its NDP, and to build what? 21. Who decided that Bleadon would have a NDP? 22. What other options/choices, other than a NDP, were considered by BPC but ultimately rejected? 23. Considering the potential creation and ongoing costs to residents, potentially tens of thousands of pounds, why weren’t ‘all’ residents/public consulted by BPC as to whether to have a NDP? 24. What is the purpose of a NDP Designated Area? Why weren’t ‘all’ residents consulted by BPC and/or NSC when the NDP Designated Area application was submitted, like previous applications by other communities? 25. BPC indicated a number of ‘exit points’ in the project, when/what are they? 26. What is the consultation process before, during and after the NDP has been put to a Referendum? 27. Who can vote in the Referendum, do people have to physically attend to vote? 28. As the NDP will affect all Bleadon residents how is the result of the NDP Referendum decided, i.e. a certain percentage of all 1000+ Bleadon residents, or a percentage of those who turn up to vote, etc. Government NDP guidelines state "The relationship between any group and the formal functions of the town or parish council should be transparent to the wider public ...The terms of reference for a steering group or other body should be published and the minutes of meetings made available to the public." NB for openness and transparency purposes all Parish Plan working/steering group information/paperwork was previously made available via the old BPC website, including contact details of the people in the groups to ensure community engagement and inclusion. 29. Why is there little easily accessible information on BPC’s NDP project to date, e.g. via its website or newsletter or indeed on request, e.g. TORs, membership, agendas, minutes, reports, FAQ of residents questions asked over the last 9 months, etc.? 30. Who are on BPC’s ‘Management Working Group’ that has been/will be advising, reporting and influencing full council decision making on the NDP project, how were they selected, how can residents access their decision making? 31. Who are on BPCs NDP Steering Group that has been/will be advising, reporting and influencing full council decision making on the NDP project, how were they selected, how can residents access their decision making? 32. Who are on BPCs NDP sub-committee that has been/will be advising, reporting and influencing full council decision making on the NDP project, how were they selected, how can residents access their decision making? 33. Are there any other BPC created or attended groups affecting the NDP process? What national, regional and local plans may affect Bleadon’s NDP? 34. How will the regional Joint Spatial Plan affect a Bleadon NDP and when will this be concluded? 35. How will NSC’s current and future district/local plan affect a Bleadon NDP and when will they be concluded? 36. How does NSC’s “Sites and Policies’ plan affect a Bleadon NDP and when will this be concluded? 37. How does NSC’s ‘Settlement Hierarchy’ village boundary/fence review affect a Bleadon NDP and when will this be concluded? 38. How do neighbouring NDPs affect the Bleadon NDP? 39. What other local, regional or national plans will affect a Bleadon NDP? Are there any incentives to create a NDP? 40. Can BPC confirm that they currently receive a 15% financial incentive for new development in Bleadon via the Community Infrastructure Levy (CIL) and S106 payments from developers? E.g. how much did/will BPC receive for the £12 million Purn/Riverside developments? 41. Can BPC confirm that NSC receives a financial incentive for each new home that it builds, called the ‘New Homes Bonus’ (NHB) and an additional bonus if it is affordable housing; and that this bonus is ringfenced for Social Care? 42. The Government Impact Assessment 2011 stated "Neighbourhood development plan take-up assumptions range from 5% in year 1 to 55% overall coverage after 11 years", please can BPC confirm whether local authorities, e.g. NSC, have been tasked with encouraging this take up to happen via Parish Councils such as Bleadon? NB only 9 members of the public attended the April 17 APM meeting last year in which BPC declared the adopted Parish Plan ‘lost’ and ‘obsolete’. More information can be seen at https://www.cpalc.org.uk/meetings-of-the-parish-polls-ballots-and-votes-of-no-confidence and specifically https://www.cpalc.org.uk/meetings-of-the-parish-polls-ballots-and-votes-of-no-confidence#PublicParishMeetingsWhatIs. See BOB Policy Hierarchy diagram including why NDPs were designed to help government and businesses resolve certain planning and development problems. E.g. “... a ‘holistic’ approach ...can include everything that is relevant to the community, including social, economic and environmental issues. It can include more than planning related issues. ” Stratford-on-Avon DC. NB In Apr 17 BPC publicly declared Bleadon’s PP 'lost' and 'obsolete‘ yet used it for their NDP application submission to NSC in Sept 17? Also in Dec 17 BPC stated that “The previous work done on the Parish Plan will be invaluable and help to reduce the time required to prepare the first draft of the Neighbourhood Plan” (BPN108)? How do these statements fit together? In Feb 18 BPC indicate moving from a PP to a NDP (Min 305.10). The Good Councillor Guide 2017 for Parish Councils states parish councils should “...consider the delivery of services and community rights, review your council’s role in the planning system including neighbourhood plans and introduce parish plans", implying that the two plans can coexist, with Bleadon’s 2009-2029 PP still therefore being valid? NB: A comparison of Neighbourhood Plans, Parish Plans and Village Design Documents by Stratford-on-Avon District Council. "If you are happy with the Local Plan and the emerging Core Strategy, you may decide that there is no need to prepare a Neighbourhood Plan. If you feel that the policies do not fully address what you would like to happen in your community, as you would like more development than is suggested, or your community would like things to happen more quickly, then you could consider preparing a neighbourhood plan.” What has BPC identified that Bleadon residents want to happen (i.e. build) that NSC’s local plan does not address? In Dec 17 BPC stated "A discussion ensued on the merits and disadvantages of the village having a Neighbourhood Plan”, why are these not already accessible to residents? (Min 303.4) In its Summer Newsletter BPC wrote “National Government is changing planning rules, which greatly reduces the ability for District Councils to refuse planning applications for new homes. Setttement boundaries, village plans and even some new neighbourhood plans have been shown to be irrelevant or at best to hold very little weight in current national planning decisions. The relaxation of planning conditions is the Government's route to significantly boosting the supply of housing, and NSC has been set a five year supply target.” BPN107. How does this fit with BPC still proceeding with a NDP without ‘all’ resident consultation? See Q42 in incentives. Also, see Locking and a Bleadon Resident's pros and cons documentation. Also Q1, Q12 and Q16. In Nov 17 BPC/Steering Group to “formulate a full plan with budget allocation and present back to the full council at the December Parish Council meeting” (Min 301.17), why aren’t ‘all’ residents allowed to have access to this information? In Dec 17 were still aiming to submit an application for a grant before 18 Jan 18, which requires a submitted plan. Also, “It was noted that North Somerset Council had given authority for the Parish to start preparation of a Plan and the intention now was to consult on a preliminary outline of the Plan to gauge public support for it.” (Min 303.4) It appears that BPC chose to submit the application for a NDP in Sept 17, and started their own outline plan before engaging with select/chosen members of the public to see whether they supported it? Where is resident access to all this decision making information? In Feb 18 BPC stated that "The initial urgency was due to grant funding ending in March 2018 but funding has now been made available until 2022." (Min 305.10) yet the grant situation was extended to 2022 in Sept 17, indicating that BPC's perceived 'initial urgency' to implement a NDP, and avoid full public consultation, has been unnecessary? Understanding the Government's plan for housing and NDPs states "... every 10 years”. In Oct 17 BPC ask for clarification on costs (Min 300.26). In Nov 17 for a full plan with budget allocation (Min 301.17) and state that no money had been spent on the NDP as of Nov 17 (Min 302.7). £500 was allocated from BPC reserves in Dec 17 and no specific allocation of budget was allocated to the NDP in the 2018/19 precept (Min 303.10). Wedmore has spent £9.5K (Min 303.10), Locking estimate £30K. Understanding the Government's plan for housing and NDPs states "The average costs are estimated at £17,000 to £63,000 per plan." E.g. via partial government grant funding that was extended to 2022 in Sept 17, and partially/predominently by residents via BPC precept? Other? Understanding the Government's plan for housing and NDPs states "The cost of preparing a neighbourhood plans will be met partly by the local authority and partly by the promoters of the neighbourhood plans. In the initial years, there will be some financial support from Central Government”. Who do Govt/BPC see as the promoters e.g. communities, landowners, developers, other? NB Residents currently have very limited access to BPC financial information yet may be expected to fund this project, via BPC precept, as it proceeds to potential completion. Understanding the Government's plan for housing and NDPs "There are also costs of reviewing the plan – estimated at an average 70 per cent of the original costs of the plan – every 10 years"
Understanding the Government's plan for housing and NDPs states "The cost of preparing a neighbourhood plans will be met partly by the local authority and partly by the promoters of the neighbourhood plans. In the initial years, there will be some financial support from Central Government”. BPC has not yet consulted with ‘all’ residents but BPC has indicated that it has been speaking to local groups (Dec 17 Min 303.10), other villages (Jan 17 Min 304.4) and some residents (Feb 18 Min 305.10). Who else, stakeholders such as developers, agents, etc? (Jan 18 Min 304.10) Why is this NDP consultation information not accessible to ‘all’ residents? For the last 9 months BPC appears to have been discussing these issues behind closed doors rather than an open ‘questionnaire’ to all residents. How have BPC been choosing who to consult rather than asking ‘all’ residents? Where is this discussion information and its outcomes? As far as we’re aware BPC doesn’t own any land, therefore has BPC already been consulting with select residents (who may also be developers), developers, agents, etc. to find land to build on? Unanimous BPC decision, majority vote of BPC councillors, poll of residents, etc.? NB In Dec 2012 BPC resolved "… to set up a Working Party to investigate the possible future need/viability of a Neighbourhood Plan for the village of Bleadon. Resolved that such a working party be set up" (Min 249.5.5) No further information is given in full council to residents as to why BPC ultimately chose not to implement a NDP at that time. What has changed for BPC to want one now? See the Govt Guidance on NDPs and other choices. In Dec 17 it appears that BPC chose to submit an application for a NDP in Sept 17 ( and started their own outline plan, before engaging with select/chosen members of the public to see whether they supported it, rather than consulting ‘all’ residents on a NDP? E.g. BPC “… noted that North Somerset Council had given authority for the Parish to start preparation of a Plan [i.e. in Oct 17] and the intention now was to consult on a preliminary outline of the Plan to gauge public support for it.” (Min 303.4) Where is resident access to all this information? BPC submitted an application for a NDP Designated Area in Sept 17 based on a PP? NB all other submitted NDP Designated Area applications had been openly consulted by NSC via its website, summarised in a table and indicated on a map by BOB. In Mar 18 BPC stated "Regarding the Neighbourhood Plan, the council’s intention is to apply for the new funding, working with parishioners in order to progress to a draft plan for wider consultation.” (Min 306.14) Will ‘all’ residents have an input into the draft plan before it is sent for consultation, like the Parish Plan process in 2005-9, or will it be created by selected residents first? See also Govt Guidelines and BOB Summary Table of BPC progress known so far. Government NDP guidelines state "The relationship between any group and the formal functions of the town or parish council should be transparent to the wider public ...The terms of reference for a steering group or other body should be published and the minutes of meetings made available to the public." NB for openness and transparency purposes all Parish Plan working/steering group information/paperwork was previously made available via the old BPC website, including contact details of the people in the groups to ensure community engagement and inclusion.” See NDP Extract re: NDP Role. E.g. How can residents access information on BPC decision making e.g. TOR, group membership, agenda, minutes, reports, etc. of council meetings, sub-groups, working-groups, steering-groups, etc.? In Nov 17 "To approve the project recommendations for the Neighbourhood Plan.” (Min 301.17). What recommendations, who put them forward? E.g. July 17 “To receive a report from the Management Working Group … The Clerk to contact North Somerset Council representative to set up a meeting with Cllr Dobson to discuss in more detail the Neighbourhood Plan initiative." (Min 297.22) & In Aug 17 “To receive a report from the Management Working Group Cllr Dobson had a meeting with the North Somerset Planning Policy Officer to discuss the Neighbourhood Development Plan initiative.” (Min 298.25) & In Sep 17 “The management working group was set up to undertake research, explore options and present these to the council for any decisions.’ (Min 299.18). How can the public/residents access TOR, membership, agenda, minutes, reports, etc. od these decisions and groups? In Nov District Councillor Porter highlighted the importance of the Joint Spatial Plan (JSP) and having a strategic plan (Min 301.4) What was BPC’s response to the JSP consultation (Min 304.14)? Gov Guidance on NDPs states "National planning policy states that it should support the strategic development needs set out in the Local Plan, plan positively to support local development and should not promote less development than set out in the Local Plan or undermine its strategic policies. Nor should it be used to constrain the delivery of a strategic site allocated for development in the Local Plan"
How has the existing15% CIL worked for large developments already approved in Bleadon? E.g. NSC indicate that there will be no CIL or S106 for the £12million Purn/Riverside Caravan Park expansion? How are any CIL and/or S106 payments received/to be received going to be used and prioritised by BPC e.g. Wake Park and Riverside Caravan Park (for traffic lights at Anchor Rd? i.e. "The traffic lights promised by North Somerset Council are likely not to materialise unless a s106 agreement from the development of the water park and the car boot sale field is finalised so drivers are asked to respect other road users and keep to the speed limit" (Highways update)), Quarry Development (for Bridge Road traffic issues? ), other? House of Commons Overview NHB 24 July 17 "The New Homes Bonus (NHB) was introduced ... with the aim of encouraging local authorities to grant planning permissions for the building of new houses in return for additional revenue…. the Government has been matching the Council Tax raised on each new home built for a period of six years. ... The development of each additional affordable home attracts an enhancement of a flat rate £350 per annum ... From 2017 a national baseline for housing growth will apply of 0.4%. Below this, the NHB will not be paid. The aim of this change is to ensure that “the money is used to reward additional housing rather than just normal growth” ... The number of years for which payments are made will be reduced from six to five years in 2017-18 and reduced further to four years from 2018-19. The funding released from this measure will be retained by local authorities to contribute towards adult social care costs “recognising the demographic changes of an ageing population, as well as a growing population”.” Other affordable housing information. Please keep in mind that all UK Local Planning Authorities (like NSC) appear to have been tasked by central government with promoting NDPs so that communities agree to some level of development in their area and to help NSC fulfill their housing development quotas. Also, NDPs have been created to speed up the planning process and make cost savings e.g. with fewer public appeals needing to be passed to the Planning Inspector by residents trying to stop developers; as communities will have 'pre-agreed' the development! At the same time financial incentives may be 'earned' by NSC and BPC through the 'New Homes Bonus' and increased CIL (Community Infrastructure Levy).